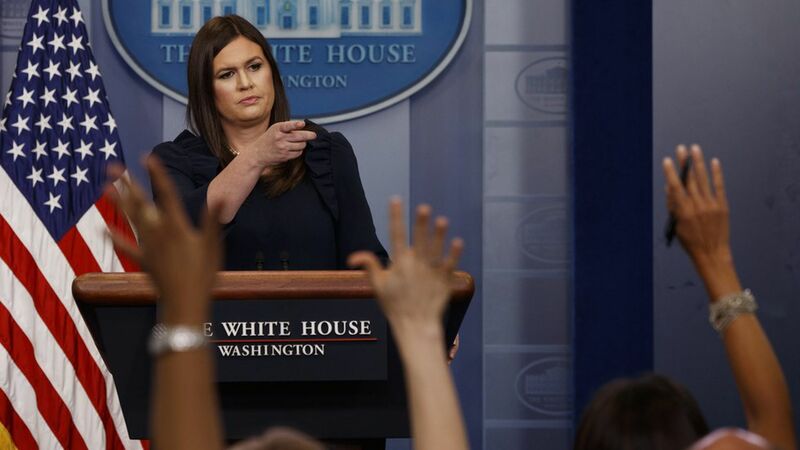 After a three week hiatus, Sarah Sanders was back at the podium briefing reporters Thursday. Asked about whether the White House is confident they'll raise the debt ceiling by the end of September, Sanders said the administration is "committed to making sure that gets raised," and added that Trump prefers a "clean" increase rather than having agenda items tied to it. Will Trump shut down the government to fund the border wall? "[Trump] campaigned on the wall... and he's going to make sure that gets done." She later dodged questions on his earlier promise that Mexico would pay for it. Trump's relationships with GOP leadership: "I think the relationships are fine." On GOP Sen. Corker questioning whether Trump is fit for the WH: "I think that's a ridiculous and outrageous claim and doesn't dignify a response from this podium." Afghanistan strategy: "[Trump's] strategy is based on conditions on the ground, not arbitrary timetables." Timeline for pardoning Arpaio: "When we have an announcement on what that decision is, we'll let you know." On dealing with Hurricane Harvey without a full-time DHS secretary: "There's certainly someone at the helm... We are in great shape having General Kelly sit next to the president."